Exa.li is a URL shortening network based in Vietnam.The revenue models of this network are URL shortener, CPC and CPM. You can make money shrinking links with Exa.li shortening network. When someone clicks on the shortened link and views the ad, you get paid. How To Join Exa.li URL Shortening Network? Go to Exa.li URL shortening network signup page and register yourself. You will receive verification E-Mail from Exa.li. Once your account gets activated, you can start shortening links and earn money. The websites or blogs of users must not host any objectionable content. You must not shorten adult links using Exa.li URL shortening network. The users must not ask others to click and view ads. You must not redirect to any other pages. Share links on the social networks like Facebook and Twitter. Put shortened links within the blog post and share with your friends. Send E-Mails or newsletters to subscribers list and embed shortened links. Exa.li pay the users on weekly basis. You must reach at least $5 to withdraw funds. The payment options are PayPal, Payoneer, Bitcoin and Bank Transfer. You can earn extra income by referring people to Exa.li URL shortening network. The referral commission is 20%. One must join Exa.li URL shortening network to earn money. If you had worked with Exa.li URL shortening network, then please share your experiences in the comments section. 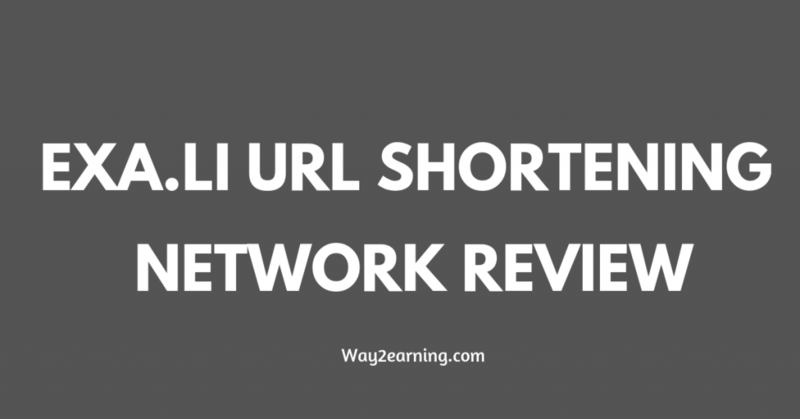 Hope this Exa.li URL shortening network review help people to get started. Join Exa.li URL Shortening Network And Start Making Money !!! I heard many times about url shortening. But I don’t know how to earn money from it.